EUROPEAN FEDERALIST PARTY » PRESS RELEASE – Juncker: the 1st elected European Commission President, accountable to the people. PRESS RELEASE – Juncker: the 1st elected European Commission President, accountable to the people. STRASBOURG – The European Federalist Party congratulates Jean-Claude Juncker as the first elected president of the European Commission and demands that his election brings more accountability and more ambition to the work carried out by the European Union. Yesterday, July 15th, the second EU legislative chamber representing the people (the European Parliament) voted by absolute majority in favour of Jean-Claude Juncker as the next European Commission President. This vote follows the vote cast in the European Council on June 27th when the heads of state and government voted by qualified majority in favour of Juncker as the next European Commission President. “Regardless to the policies that may be carried out by Jean-Claude Juncker, this is a victory for democracy in Europe” argued the co-President of the European Federalist Party Pietro De Matteis. 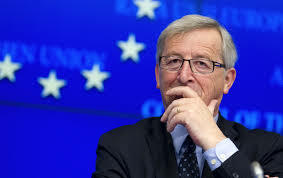 Juncker was the candidate put forward by the party who obtained the most votes at the latest European Elections in May. As such he was the first to seek a majority in the two legislative chambers (Council and Parliament) through negotiation with the other political forces, similarly to what happens in many parliamentary democracies. “This new procedure to elect the European Commission President brings more power to the people and makes the EU more democratic as from now on it will be up to the people to vote for the president of the European Commission, who will be accountable not only to the European Council and to the Parliament, but also to the People directly” continued the co-President. This is also a victory of European public opinion which refused to accept an attempted “coup d’état” against the European Parliament and the voters which seemed to be in preparation after the informal European Summit of May 27th (see EFP press release of June 2nd) when several heads of state including Cameron, Orban and Merkel – with the tacit accord of others including Renzi, refused to openly support Jean-Claude Juncker as the winner of the European Elections. The European Federalist Party was the first to call for the respect of the results of the European Elections and launched the initiative: “Respect our Vote” (www.respectourvote.eu) run in partnership with other NGOs such as Project for Democratic Union, One Europe, JEF Belgium and JEF Brussels. CONTACTS: The contact person for this press release is Marirosaria Marziali: mariarosaria.marziali@gmail.com (mobile: +32484077897). The co-president of the European Federalist Party Pietro De Matteis can be contacted by writing to: pietro.dematteis@federalistparty.eu. WHO WE ARE: The European Federalist Party (EFP) is the pan-European party for a more democratic, united and solidary Europe. Founded in 2011, the EFP has sections in 16 countries and took part in the 2014 European Elections in 6 countries. The EFP was instrumental in the introduction of several key reforms in the EU including the European Citizens’ Initiative and the EU roaming regulation. More information is available on our website www.federalistparty.eu and on Facebook: www.fb.com/EuropeanFederalistParty .